How can biofuel be certified sustainable? Examine guidelines, criteria, and measurable indicators. 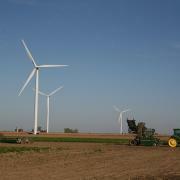 Windmills on a farm. Photo: Farm Energy Community of Practice. The idea of developing explicit sustainability standards related to agriculture and energy usage is relatively new and undeveloped, but serious efforts have begun in one area of great interest and concern: biofuels. Several national and international organizations are working to develop biofuel certification standards based on clearly defined principles, criteria, and indicators of sustainability. Many of these standards already refer to agricultural practices; others could easily be adapted to do so. A principle is a concisely formulated guideline or rule, presented as a basis for reasoning or action. Three examples are that farming should maintain and improve soil health, reduce greenhouse gases, and enhance food security. An indicator is a measurable or observable feature that is used to test whether some criterion is being met. How can we tell if a soil’s organic matter is near optimal levels? One measurable indicator could be that water-holding capacity is at least 0.2 inches of water per foot of soil depth. What sort of test or measurement would help us determine whether a biotic community is near optimal levels? An indicator could be that earthworm density is at least five worms per cubic foot. Sustainable biofuel production—including crop production, conversion, and delivery—would be environmentally, economically, and socially viable now and for future generations and would move the world away from an unsustainable reliance on fossil fuels. Several national and international organizations are working to develop formal guidelines and standards for sustainable biofuel production. Examples include the Roundtable on Sustainable Biofuels, the Global Bioenergy Partnership, and Sustainable Biodiesel Alliance. Crop-specific sustainability standards for palm oil, soybean, and sugar cane. Sustainability criteria recently incorporated into new biofuel quality standards being developed by the International Standards Organization (ISO). A biofuel component of a sustainable agriculture standard being developed by the Leonardo Academywhich is currently going through the American National Standards Institute (ANSI) process. Listed below are several key topics critical to the development of sustainability standards for biofuels. Many of these examples are adapted from the report Increasing Feedstock Production for Biofuels, from USDA’s Biomass Research and Development Board. The article on Key Components of the Biofuels Sustainability Debate also addresses key issues of concern around biofuels and sustainability. 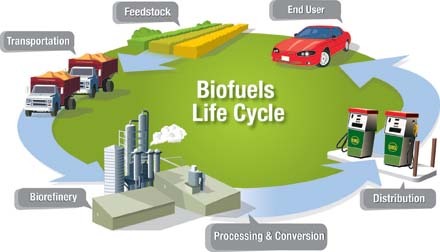 Biofuel Life Cycle Analysis requires assessment of all inputs and outputs from feedstock production through to end use. US Department of Energy Image. Sustainable biofuel production and use would generally be expected to reduce greenhouse gas emissions over the entire life cycle of the fuel, at least in comparison to fossil fuels. Some would go further and advocate that a truly sustainable biofuel should not increase greenhouse gases at all. A biofuel would not generally be considered sustainable if its production required large amounts of fossil fuels or consumed more energy than the potential energy contained in the biofuel itself. Such a fuel would do little to reduce the world’s reliance on fossil fuels. Net energy balance calculations compare the amount of potential energy in a manufactured product to the gross amount of energy that was consumed in making that product. These calculations are commonly used as indicators of industrial efficiency and can also be used as indicators of sustainability. Sustainable biofuels would not create or worsen food insecurity. Biofuel production can affect food availability and cost in many ways. For example, farmers might sell edible crops like corn or soy to biofuel plants instead of food producers, or they might choose to grow inedible “energy crops” such as switchgrass or willow instead of human food crops. Other economic effects are more subtle and complicated; for example, changing cropping patterns in one region can increase land cost and food prices in other parts of the world, reducing the ability of regions or nations to feed themselves. Shifting from one crop or production system to another can affect availability of the displaced crop and the productivity of the land. These shifts can affect crop prices, labor, and resources, with potential adverse or beneficial economic and environmental effects. Bringing uncultivated land into production may likewise have economic, social, and environmental impacts. 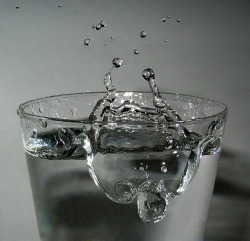 Water is used to irrigate feedstocks and to convert feedstocks to biofuels. Sustainable practices should include efficient water use through crop development, production, use, and management; conservation practices; and water purification, reuse, and distribution technologies. Sustainable biofuel production would generally be expected to maintain or increase surface and groundwater supplies. A sustainable biofuel should maintain or improve water quality at every stage in its production. Sedimentation, nutrient flow, and pesticide runoff have the potential to degrade water quality and aquatic habitat. A sustainable biofuel should not cause air pollution and should maintain or improve air quality at every stage in its production. Considering all aspects of their production and use, sustainable biofuels would generally be expected to maintain or improve biodiversity and the healthy functioning of ecosystems. Sustainable biofuels would be made from sustainably-grown crops, using farming practices that maintain or improve soil health. Soil loss through erosion is only one measurable indicator of a sustainability concern. Soil structure and compaction, soil organic matter, and soil microbial communities all influence soil productivity and tilth, affecting the ability of soil to adsorb and assimilate nutrients and sequester carbon. Multiple studies have indicated the need to leave at least one-third of row crop above-ground biomass materials and residue to prevent soil erosion. At a minimum, sustainable biofuel production would be expected to follow established laws and respect human and labor rights, as well as legitimate land and water rights. Some go further and advocate that a sustainable biofuel should contribute to the social and economic development of local people. Using Criteria and Indicators for Assessing Sustainable Biofuel Production. US EPA.